Clear Aligner: Clear aligner is a method of orthodontic treatment which is completely transparent, brace less, wireless and metal free. 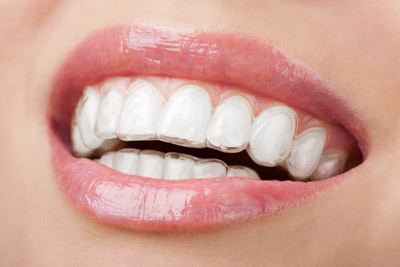 The aligners consist of a sequence of clear, removable trays that fit over the teeth to straighten them. Each tray must be worn by the patient for a specified amount of time—usually around 20 hours a day for two weeks--before the patient can progress to the next tray. As you replace each aligner, your teeth will move – little by little, week by week until they have straightened to the final position. Dr. Tamim will discuss with the patient the right treatment method depending on the case. Instant orthodontics: Crowded teeth are the main complain of many adult and duration of the long orthodontic treatment is another complain. Instant orthodontics should not be confused with traditional metal braces. Instant orthodontics are an almost pain free alternative to metal braces. You can get straight, beautiful teeth in just a couple of visits to Luxe Dental Clinic. Instant orthodontics provides a quick and permanent way to get the results you desire.